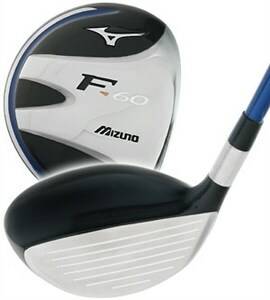 Available in 3-wood (13.5 & 15 degrees), 4-wood (16.5 degrees), 5-wood (18 degrees) and 7-wood (21 degrees) the Mizuno F60 fairway wood features a Perimeter Weight Slot (Mizuno's marketing term); when combined with the ultra-thin titanium crown, together these position weight deep inside and around the perimeter of the club head. This design is said to enhance forgiveness on off-center hits and make it easier to achieve a higher launch trajectory. The thin titanium crown is brazed to the stainless steel face (titanium is considerably lighter than steel, so this is where the weight savings comes in). The F60 uses a traditional tear-drop head shape and offers a clean profile of the type often preferred by better golfers. To address the issue of off-center hits, Mizuno uses their CORTECH head design (another catch-phrase take-off of the COR acronym) which utilizes multiple face thicknesses for maximum Co-efficient of Restitution (COR). When you can increase/improve COR on those less-than-ideal contacts, you capture more energy from the ball/club strike, and that translates into increased distance and higher initial ball velocity. The shaft options are typical with both steel and graphite available. Steel is the TT Dynamic Gold, while the graphite option is the Exsar FS3 shaft. Overall, the F60 series is a good performer for the slightly better player. If you're a mid-to-high handicapper, keep looking as this club will likely not give you the type of performance you're after. If you're in the better player realm, however, this club -- like the Mizuno player irons mentioned earlier -- may be just what you're after. If the F60 appeals to you, also consider the Titleist 909 F3 fairway wood.